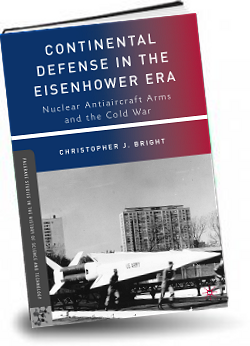 This book tells the interesting and little known story of the thousands of nuclear antiaircraft weapons which were deployed in more than one hundred locations around cities and defense installations in the United States during most of the Cold War. Beginning in Dwight D. Eisenhower's presidency, these Army Nike -Hercules missiles, Air Force Genie rockets, and BOMARC and Falcon missiles were meant to destroy Soviet planes over (or near) U.S. airspace before they attacked America with atomic bombs. TV's Lassie, Hollywood insiders, a Massachusetts industrialist, a beauty pageant contestant, and others, including officials who worried these weapons might harm local television reception, played roles in promoting the arms to Americans.